Dis Tew Much: Mayor Rahm Emanuel Plans to Bill Jussie Smollett, Illinois Could Withhold Tax Credits From Empire, and the Osundario Brothers May Have Worn Whiteface? Actor Jussie Smollett waves as he follows his attorney to the microphones after his court appearance on March 26, 2019 in Chicago, Illinois. Charges have been dropped, but it doesn’t look like this entire Jussie Smollett saga has any plans of slowing down any time soon. Smollett claimed back in January that he was the victim of a homophobic and racist attack. Disorderly conduct and false police report charges against the 36-year-old stemming from that disputed claim were dropped on Tuesday, sparking a whirlwind among the Chicago Police Department, the Chicago Mayor’s Office, and special interest from the commander-in-chief himself. On Thursday, the wayward candy corn known as America’s president tweeted his plans to get the F.B.I. and Department of Justice involved in the matter. However, Chicago Mayor Rahm Emanuel believes this is primarily a job for the city. 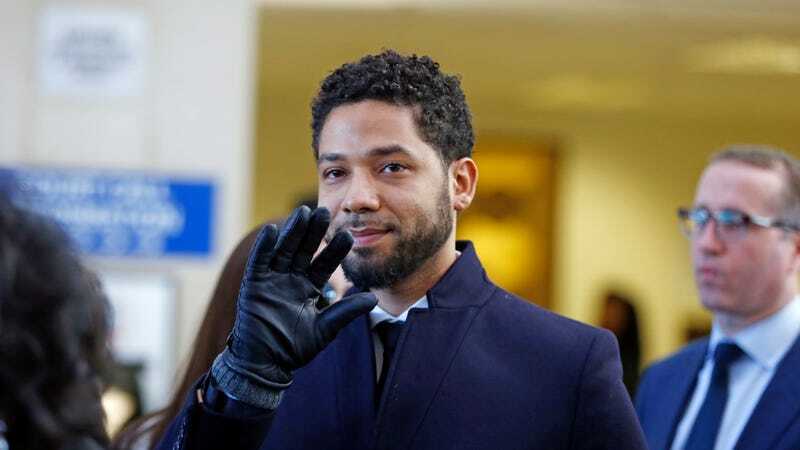 Dismissing the fact Smollett has been cleared of all charges, the mayor is seeking $130,000 owed to the city, still accusing the actor-singer of an alleged hate crime hoax. On the flip side, Smollett’s legal team believes city officials owe their client an apology. “He, at this point, again has been victimized much more by what’s happened afterwards than what happened that night,” said attorney Tina Glandian on Thursday on The TODAY Show. Further, Glandian said that based on her client’s recollection of the attackers having white or pale skin, she believes the Osundairo Brothers—who are believed to be the attackers—may have worn whiteface. Additionally, it looks like Empire’s production may be affected by this whole fiasco as Illinois may be snatching away some much-coveted tax cuts. Amid the mess, Smollett may have a personal career achievement to look forward to, as he is nominated for an NAACP Image Award this weekend, for Outstanding Supporting Actor in a Drama Series (Empire). It hasn’t been confirmed whether or not Smollett will attend the ceremony on Saturday, May 30.